In the Bible, in the Old Testament, Joshua was the leader who brought the children of Israel to the Promise Land - Canaan, the land of milk and honey. Recall that Moses was the leader that led the Israelites out of Egypt, but because of their disobedience, they wandered in the desert for 40 years. The generation that left Egypt would not get to see the Promised Land. Joshua is part of the new generation and Joshua is being led by God. He is fighting battles for them and they are capturing many lands. "Every place that your foot shall tread upon, I have given to you." (Joshua 1:3) The only pre-requisite was that Joshua is strong and very courageous. (Joshua 1:7) As they crossed the Jordan river, they began to live out this promise. Joshua and his men conquered Jericho, Ai, and the surrounding cities. As the Lord fought battles for the children of Israel, they had constant victories to the extent that the surrounding nations were afraid. Joshua 10 describes a story where five kings are afraid of Joshua because of his conquests. As the story begins - the kings come together to figure out how to defeat Joshua. God told Joshua, "Fear them not, for I have delivered them into your hand." (Joshua 10:9) The kings were: the king of Jerusalem, the king of Hebron, the king of Jarmoth, the king of Lachish and the king of Eglon. When kings fear you because of your courageous faith, you are doing something right. Then God comes through in stunning fashion - hailstones fell from heaven to defeat the enemy and the sun and the moon stood still to record the longest day ever, This happened so that Israel could defeat their enemy. At this point, the five kings hid in a cave. When Joshua became aware of it - he commanded his men to barricade the entrance of the cave and to continue fighting. This was war so there was lots of carnage. After all of this, Joshua commanded that the kings be brought out. 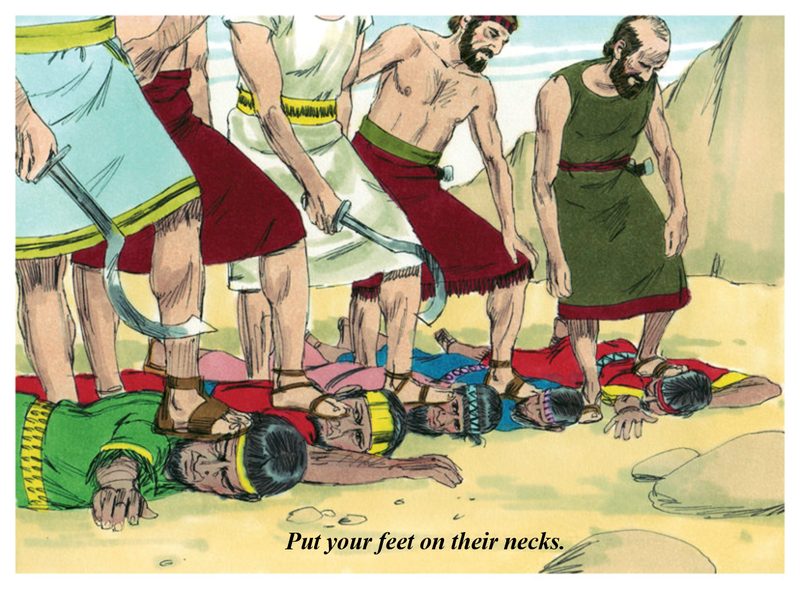 Joshua then told the men of Israel - the captains of the men of war, "Put your feet upon the necks of these kings." And they did it. This action was an indicator to the children of Israel that these kings were defeated; that God had promised this land to them and it was theirs; that even though they were kings they were nothing in God's sight; that what seems impossible and implausible to you is possible with God; that you don't need to be afraid of people in elevated positions if God is fighting your battles. At that moment, with their feet on the kings' necks, Joshua said, "Fear not, nor be dismayed, be strong and of good courage. For this shall the Lord do to your enemies against whom ye fight." I would imagine that there are many variations to placing your foot on someone's neck, but the one that I envision is one where you raise your foot to the height of the person's neck. You are momentarily off-balanced but you harness your core strength to position your foot on the person's neck. Once stabilized, at this angle, you are able to wreak havoc and destroy what is in your way. That's how I would imagine it. You are going from the very bottom to the top. Whatever is under your foot is in subjection to you. Joshua possessed courageous faith so that he was able to defeat the kings. In making a point to the people - his captains, he reinforced the greatness of God by letting them know that their enemies would be defeated. Do you have courageous faith to defeat the kings in your life? What do you need to put your feet on, in faith? i like to put my feet in human and or/dog feces. it feels good between my toes.